DESCRIPTION: History may see the NATO occupation of Afghanistan in a very different light decades from now. It is a beneficial maxim that decisions in anger should be avoided. It was entirely understandable that the United States would recoil in horror from the shock of the 9/11 attacks on New York and Washington, and then roll back in anger demanding a decisive punishment for the attackers. That the chaos of the Russian retreat from their invasion of Afghanistan should have left a rogue state where an extreme religious faction should effectively be sharing power with a terrorist organisation, created a natural target for the advanced weaponry of the US and its allies. Where it all went seriously wrong was that European and American politicians came to see warfare as a convenient diversion from domestic issues, giving the appearance of strength and invincibility. The result of that was to prove a lack of forward planning, with a failure to have any clear plan of how to exploit the initial military victory and prepare an exit strategy. Having forced the terrorists out of Afghanistan, the NATO force had only displaced them into Pakistan, rather than breaking them as a threat. There was still time to produce a credible strategic policy and implement it, but the US took their focus away to Iraq and added another military campaign area and a further drain on resources, without completing the task in Afghanistan. Part of the problem was that the military part was initially straight forward. Aircraft and ground forces could be deployed against identified targets and alliances could be formed with local warlords, but the lightly equipped resistance could melt away and then attack unexpectedly. What was required was accurate and adequate intelligence and a clear idea of how a friendly and effective aboriginal government could be assisted to govern in its own interests and within its familiar culture. Attempting to force European and American concepts of democratic government on a culture that needed to evolve at a pace to suit its needs was never likely to succeed. Eventually, NATO would have to leave and, when its last soldiers withdrew, it would leave an untidy vacuum that could be filled by something even more dangerous than that which had existed before invasion, repeating the mistakes made previously by the Russians. Whether Afghanistan will eventually develop a government system that suits Afghans and does not threaten the West remains to be seen. It appears unlikely, not least because the West has still not developed the intelligence and diplomatic capabilities to influence the process. In the meantime, NATO soldiers are still dying and being wounded. All soldiers are required to kill to achieve the objectives set for them, but the sniper is in a category of his own where his primary function is to kill the maximum number of enemy soldiers, particularly high value targets such as enemy commanders. Technology has delivered the weapons to fire targeted shots at considerable range. Wellington’s riflemen in Portugal and Spain managed to kill at a range of up to 700 metres with their flintlock Baker rifles, when a standard infantry musket was not accurate beyond 200 metres and often lacked the quality of powder to kill much beyond 50 metres. Today, the sniper is not much different in relation to the standard infantry man. From 1939, it has become increasingly common for armies to be equipped with lighter rifles, able to accurately fire up to 150 metres and have the ability for full automatic fire. That provides a compact weapon and lighter ammunition to allow an infantryman to carry more rounds to support high rates of fire. Against that, the sniper will have a hand made, or hand finished, long rifle, probably still with bolt action, because the objective is to use skill, carefully manufactured rounds, and high accuracy sighting optics with a barrel and action that have been produced to the highest standard, allowing a relatively small number of aimed rounds to be fired at a target that is 1000 metres or more away from the sniper’s nest. The author has produced a book that conveys the realities of life for the sniper in Afghanistan, the highs and lows, the fear, boredom and excitement. This is a book that is compulsive and totally absorbing. It paints a graphic picture that introduces the sniper and the many pressures, psychological and physical. It is a thrilling and action-packed story and provides a related view of the other arms that integrate with the sniper. 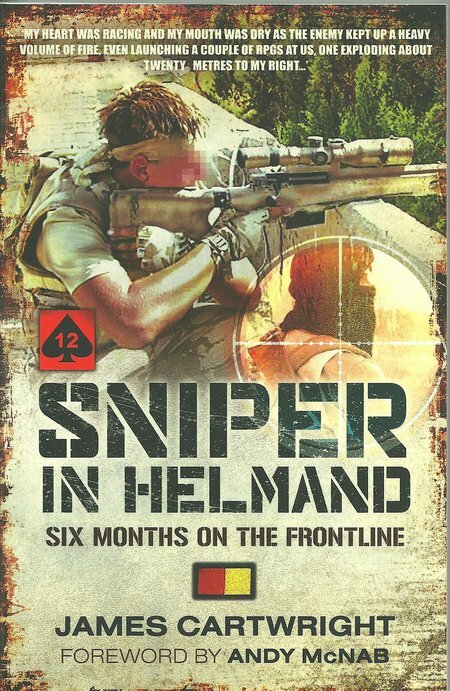 This is the first book to be written by a trained sniper in Afghanistan and one of only a handful of books written by snipers from any battlefield.